Gender war, shmender war. 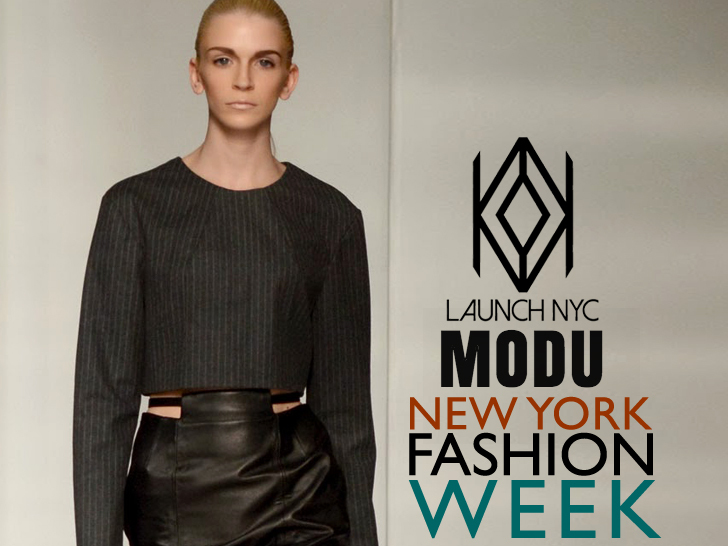 Modu proves that the opposing sexes can make beautiful clothing together. Menswear designer Yuteng Mo linked arms with womenswear impresario Schichao Du to create a borrowed-from-the-boys capsule that luxuriates in its spare silhouettes, rigorous tailoring, and dandyish flourishes. Presenting at Launch NYC during New York Fashion Week on Wednesday, Mo and Du tried to "integrate the simple profile of tough and clean lines to create a handsome, chic yet easy-to-wear image," they told Ecouterre. Cropped top with raglan sleeves and navy skinny pant. Green jacket vest with navy straight pant. Closeup of the jacket vest. Cropped jacket with waistband detail and navy skinny pant. Double-face wool jacket with dolman sleeves and side-zipper details. Pinstripe long dress with pleated detail. Shearling parka, leather top, and full skirt. Shearling bike jacket with raglan sleeves. Cropped top and leather pencil skirt with extended belt panel. Designers Yuteng Mo and Shichao Du.